This fall we are celebrating 25 years since the publication of R.C. 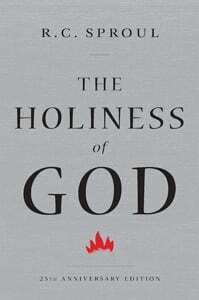 Sproul’s foundational book, The Holiness of God. In honor of this occasion, we are offering a unique, hardcover 25th anniversary limited edition book available exclusively through Ligonier Ministries for a donation of any amount. The need for teaching on God’s holiness is as great or greater today than at any time in recent memory, so we thank you for your support of the ministry. The following interview was taken from the November 1990 issue of Tabletalk magazine. Q. What inspired you to study the holiness of God? A. In my own theological studies, my favorite theologians – Augustine, Luther, Calvin and Edwards – all seem to have a common thread woven through their works. Each of these theological giants wrote with an exuberant sense of adoration for God. God’s majesty would just jump off the page at me. They made a tremendous impression on my own thinking and development. One of the things that seems so obviously absent from contemporary evangelical Christianity was any kind of focus on the majesty of God the Father. So I decided to pursue a study of the topic myself. These men had whet my appetite. I wanted to learn more. Q. How many years did you study the topic? The first time I organized my thoughts on the topic was in 1970. I put together a series of five lectures for a Young Life leadership meeting at Saranac Lake, New York. The response was overwhelming. At the presentation was Dora Hillman, who was instrumental in building the Ligonier Valley Study Center in Pennsylvania. Also present was Roger Gulick, an assistant minister of Lookout Mountain Presbyterian Church in Chattanooga. He audio taped the series and placed it in the lending library at his church. A year went by- maybe two – and Roger invited me to his church to do the series. While there, I spoke at chapel at Covenant College. The president of Covenant’s student body was Mike Cromartie, who later became Chuck Colson’s research assistant and introduced Chuck to the series. Chuck was deeply touched by the series and it was through him that the Maclellan Foundation- one of Ligonier’s biggest sponsors throughout the years- found out about us. In many ways, Ligonier Ministries began when I gave those first lectures at Saranac Lake New York. I first presented the series at the Ligonier Study Center in 1975. Jack Rowley, in charge of video education at General Electric in Cincinnati, and his family came and videotaped the lectures for his own use in a home Bible study. It turned out to be the first Ligonier videotape series. When we first tried to promote the series in a major campaign, it almost put the ministry under. It was an unqualified financial disaster. But unknown to us at the time, God Was working in secret and unseen ways to introduce the series to people who would eventually help us distribute it nationally. Certainly this series, more than any other, has been responsible for the expansion of Ligonier Ministries over the long haul. Q. Has the series changed much since those first lectures? A. Not really. Originally, I did a six lecture series with each lecture being about an hour long. But churches requested that it be shortened to facilitate Sunday school classroom study, so I did a second series in half-hour segments which meant I had to cut a lot out. In the original series I was able to get into more detail about Rudolph Otto’s classic work on the idea of the holy and the ambivalence people have toward it — they are both repulsed and attracted. I also had a segment on holy space and holy time based largely on Hendrick Kraemer. Then, too I had some thoughts from Mircea Eliade, the anthropologist, who like Otto had studied the phenomenon of the holy in various cultures and religions. Q. Do you ever get tired of the topic? A. I have spoken on that passage from Isaiah 6 — when Isaiah sees the Lord seated on a throne, high and exalted — probably a couple hundred times. Sometimes before I speak I say to myself, “I can’t do it one more time, and besides, people in the congregation have probably already heard it and they’ll be bored as well.” But I have never experienced boredom while speaking, and I don’t think my listeners have either. I never give the messages exactly the same way twice and I try to keep researching the text to find new things. Q. What responses to the series have touched you the most? A. I’ve had countless people use the expression that listening to the series “completely revolutionized their understanding of God.” Comments such as these touch me deeply. Chuck Colson’s testimony certainly meant a lot to me. Bill Hybels, pastor of Willow Creek Community Church in Chicago, told me that he had to pull his car off the road while listening to the series. He was weeping and couldn’t drive. When John MacArthur heard it, he interrupted a preaching series to preach on the holiness of God. These stick in my mind. Q. What has been your most recent experience of the holy? A. I recently preached at Three Rivers Baptist Church in Columbia, SC. Prior to the service I met with the elders for prayer. We got down on our knees and I have never heard such prayers from laypersons extolling the majesty of God. They explained to me that their pastor had experienced an awakening to God’s majesty and it had gone through the congregation like wildfire. What an exceedingly moving experience to preach in that environment. Later that day I drove to Augusta, GA. and spoke at John Oliver’s church on Revelation 5- Christ as the Lion and the Lamb. There was a terrible storm outside, yet the place was packed out, and a tremendous spirit of worship permeated the sanctuary. Q. Do you remember your first experience of the holy? A. I really wasn’t tuned in to things of God as a child, yet I do remember one experience. I lived in Pittsburgh, the steel capital of the world, about a mile and a half from the world’s largest slag dump. From the blast furnaces, molten slag would be transported in huge train cars shaped like giant ladles to a place that looked like a volcano. Then these ladles would be tipped and the molten steel would pour over the side of a 250 foot hill. As the molten lava rolled down the side of the hill, it would form beautiful figures. The brilliance of that display would illumine the sky for miles. One night when I was in eighth grade (before I became a Christian), it was particularly dark outside. When I crawled into bed, I was overwhelmed with a terrible feeling of dread. I was overcome with gloom. I had a profound sense that someone was in the room with me that shouldn’t be. I was terrified. Then the sky lit up from the molten lava. The sudden light coupled with the dark only heightened my fear. I didn’t hear any voices, but an idea went sharply through my head. I found out later that the words were from Scripture which I had never read. “Fear not, for I am with you.” As soon as those went through my head, I was enveloped with a sense of total calm. The next thought that went through my head was “Go throughout the world and preach the Gospel to every living creature.” The next thought was “Take Vesta [R.C.’s future wife] with you. “ I decided at that moment to be a minister even though I wasn’t a believer. I didn’t become a Christian until my first year in college. I don’t tell that story very often because I don’t want people to get the wrong idea that you have to hear bells and whistles before you go into the ministry. In any event, I told people the next day that I was going to go into the ministry. Five years later I became a Christian and eight years later I married Vesta. Q. How do you account for the popularity of the series even though we live in an unholy time? I believe that despite the lack of popularity of the holiness of God in contemporary preaching, the Creator has made us such that if we have the Holy Spirit within us we must have some deep hunger and thirst to know more about God’s majesty. So when it is put before us, even in the feeble way that I do it, it strikes a chord in the heart of the believer. I am comforted by the fact that an ultimate standard of righteousness and truth exists. The whole world can compromise it, but God won’t. What freedom there is in that. I am always afraid that because I write on the holiness of God, people are going to think that I am extraordinarily holy when in reality just the opposite is the case. The more I study God’s holiness, the more I see my utter unholiness. I am utterly dependant on the grace of God. Donate a Gift of Any Amount for your Special Anniversary Edition of The Holiness of God.